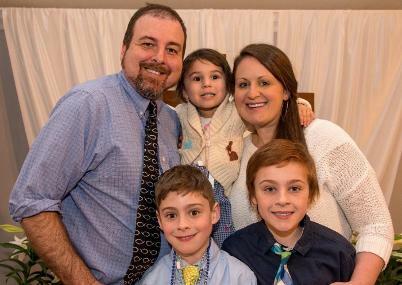 Hello, I am Tom and I have been pastor at Crossroads of Faith since 2014. I grew up in Florida, baptized and confirmed at First United Methodist of Ormond Beach. I accepted a call into ministry during my senior year in high school and studied Christian and religious studies at Florida Southern College. While in college, I was Youth Director and Assistant Director of After School Ministries. Youth. Children have always held a special place, but I determined my calling to be towards Word and Sacrament. I entered Garrett Evangelical Theological Seminary to begin the processes of ordination as an Elder in the United Methodist Church. Upon graduation, was appointed as pastor of the congregations of Marseilles & Seneca from 2006-2011. Before coming to Bolingbrook, I served Dakota UMC for three years. During college while serving as a summer camp counselor, I met Kim, who was attending Western IL University. After finishing college, I loaded my pickup and moved to Illinois. Kim and I were married in August of 2003 and have three amazing children. Owen is the oldest. He is a fan of Spider-Man, loves science and has a goal of becoming an Eagle Scout. Eli is in elementary school. He loves Cub Scouts, Star Wars, and riding his bike. Anna is our preschooler. She loves princesses, the playground and sports. I have spent the last twelve years as pastor in churches across Northern Illinois. I believe God loves us for who we are and meets us where we are in life. The Christian faith is alive and dynamic. The church is called to live within the story of Christ and connect his story to the world. Romans 12 says, “Rejoice with those who rejoice, weep with those who weep. Live in harmony with one another. I believe we can find community in Christ that carries us through all the highs and lows in life. I love sports, especially the Chicago Cubs. I watch every superhero movie in the theater. I would rather spend my time outdoors than indoors. I love Autumn when it is filled with great weather, football, corn mazes, apple cider and wonderful holidays. I enjoy meeting with people over a cup of coffee or tea and getting to know them. Tell me your favorite coffee place and I’ll treat!